If you are a visitor to the golden state of California, plan a unique ghost-hunting adventure and stay at one of California's historic haunted hotels. And if you are a resident of California, get to know your state's spookier side and embark on an exploration of the unexplainable and visit one of California's very own haunted hotels. One of its most haunted hotel is the historic Queen Mary Hotel in Long Beach that is not only a hotel, but was once a luxury ocean liner. Perhaps better now known as a ghost ship. Within the sweet little town of Groveland sits the even sweeter Groveland Hotel. Groveland, a historic gold-rush town is just outside of the breathtaking Yosemite Park. The inn is both quaint and cozy and run with “southern hospitality.” The current innkeepers also like to share with its guests a little well-known secret. They have a resident ghost by the name of Lyle. Lyle was a reclusive old gold-miner who used to work at the neighboring mine. Since it was close by, Lyle stayed at the Groveland Hotel for his residence. He lived in room 15 until he died there in 1927. Based on many reports, good ole Lyle – or at least his spirit – continues to stay in room 15 at the Groveland. When Lyle was alive he liked to keep his room obsessively cleaned. He still seems to have this desire. If you happen to stay in room 15, Lyle makes sure his dresser drawer stays neat and tidy. He is not too fond of women’s cosmetics cluttering his dresser – guests have returned to their room finding their cosmetics mysteriously moved to the sink. One guest had actually watched her makeup hop over the back and land on the floor! The ever-playful Lyle also likes to mess around with the lights and turn on the water in the shower when no one is using it. He can even somehow make it so a key temporarily does not work in a lock. The mysterious activity seems to be limited nearby or in room 15. A romantic note: Across the street from the Groveland Hotel is The Charlotte Hotel. It was built and operated by an Italian immigrant named Charlotte DeFerrari. It was believed that Lyle and Charlotte were lovers. Whenever Lyle’s presence disappears for a while from the Groveland, some think he might actually be visiting his old love across the street! The owner and innkeeper of the Groveland Hotel, Peggy Mosley, has a collection of paranormal events and ghost sightings compiled from employees and guests – and she is more than willing to share it with inquirers. You can contact Peggy at the Groveland Hotel at 800-273-3314 or 209-962-4000 to hear detailed accounts. 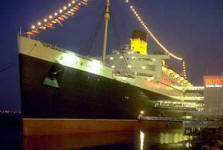 The Queen Mary, once a historic ocean liner now docked, is considered one of the most haunted hotels out there. There are specific places, or "hot spots" that are particularly psychic or haunted. 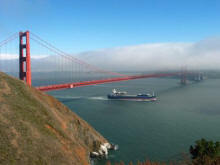 The hotel offers haunted history tours called Ghosts & Legends that can take you to these areas. The first-class swimming pool - haunted by two women and a boy. The pool's changing rooms - psychics pick up very strong negative energy from this area. First Class Suite area - haunted by strange balls of light and the apparition of a black-haired man in a 1930s suit. Forward Storage Room - haunted by the sounds of children playing. Kitchen - haunted by the screams of the ship's cook, supposedly murdered during WWII for his horrible culinary skills. Bosun's Locker - which is the area of the hull which sliced the British Light Cruiser Curacoa in half during World War II. Because of her wartime sailing orders, the Queen Mary was not allowed to stop to rescue survivors, and 338 men perished in the cold ocean. There have been unexplainable pounding sounds there. Watertight door #13 - 18-year-old crewman, John Pedder was crushed to death while trying to slip through an automatically closing door in Shaft Alley during a routine watertight drill on July 10, 1966. Now he is said to haunt door #13. Located in breathtakingly beautiful Coronado, near San Diego, the Hotel Del Coronado holds a sad ghost story involving love. 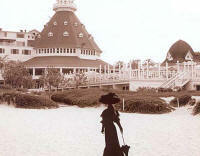 The story is set in 1892 when a woman checks into the Hotel Del Coronado, under an alias. She was later identified as Kate Morgan. She checked into room 3502* to meet her estranged husband for Thanksgiving. However, he never showed up. A distraught Kate was later found dead, by a self-inflicted gunshot wound on the hotel steps a couple of days later. Sightings of a young woman dressed in black lace have been reported since Kate’s death. 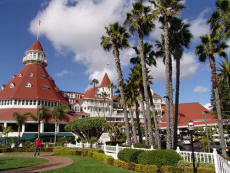 As well, staff and guests of the Hotel Del Coronado experience unexpected breezes and strange noises while at the hotel. In room 3502, parapsychologists discovered 37 abnormal readings in one day! *Just to note, there has been some contradictory information regarding the correct room number. In some accounts the hub of ghostly activity is in room 3327. 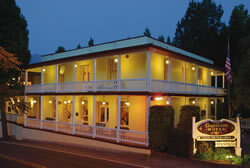 The Springville Inn is located near the southern tip of California’s Sequoia National Park. The inn is located on the main drag in town – highway 190 – and is one of the major sources of activity for both tourist and resident alike. The inn claims to be the hub of some paranormal activity as well. The Springville Inn reports that it is home to four ghosts. These four ghosts only haunt the main building of the hotel which was built in 1911. This building was once known as the Wilkinson Hotel. Keep in mind that none of the actual hotel rooms experience any paranormal activity. The building that houses both the rooms and the Grill room restaurant were later additions to the original 1911 structure. 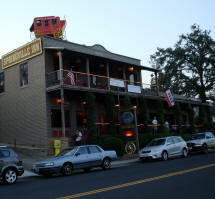 Most of the activity is said to be located on the second floor of the building which now serves only for entertaining. The inn’s website claims that the ghosts mostly have only a presence at the inn, with limited interaction and/or sightings. So who are these four ghosts and what exactly have they done to garner attention? One of the spirits is referred to as the “Young Man.” He was a logger working around the Springville area who was apparently shot outside the hotel in the street and was carried inside the hotel where he bled to death. His spirit has been seen floating up the main stairwell (left). He also has been known to brush up against the ladies! The “Young Man” has also been seen walking hand-in-hand with the spirit of the “Little Girl.” She is reported to be about the age of eight and wearing a turn-of –the-century dress. A past employee reportedly saw the reflection of the “Little Girl” staring at her in the mirror while she was doing the dishes. The mirror was removed and the “Little Girl” has not been seen again. The third spirit is that of the “Woman” – said to be a beautiful blonde lady in a long dress floating on the balcony (right) and wandering the second floor hallway of the main building. The last spirit is that of the “Old Man” - the most observed of all the spirits at the inn by past and present employees. He’s a loner who hangs out in the kitchen areas watching those around him. He has been seen staring up or down into the dumbwaiter joining the two kitchens. On a recent visit to the Springville Inn, I regret to inform that I did not encounter any of these spirits. I took my digital camera upstairs of the main building and took both flash and non-flash pictures. I did not catch anything. Also, I didn’t really pick up any “vibe.” I either did not attract their energy or they were elsewhere during my time up there. Left a bit disappointed.